Adrian Heath was a leading figure in the British Constructivist movement of the 1950s, alongside Victor Pasmore, Anthony Hill and Kenneth and Mary Martin. It was Heath who organized many of the groups early ground-breaking exhibitions, often at his own studio in Fitzroy Street. Unlike his fellow Constructivists, however, Heath always worked in paint, his art being 'constructed' out of sub-dividing the canvas into harmonious elements, often according to mathematical principles. At the end of 50s, there was a marked change in Heath's work, undoubtedly due to his teaching at Bath Academy of Art, Corsham, where he mixed with a different group of artists to those he had exhibited with previously. 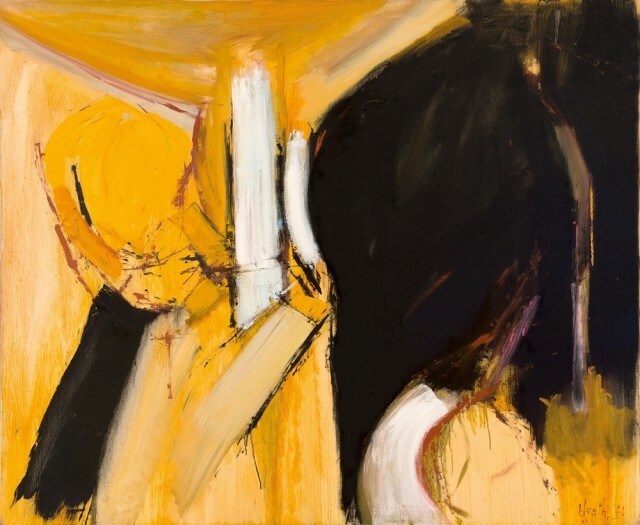 From about 1960 hints of the body can be seen, whilst his brushwork becomes looser, more fluid, suggesting the work of de Kooning, whose paintings Heath would have seen at the influential shows of American art at the Tate in 1956 and 1959. Heath's work is held in a number of major public collections throughout Britain, as well as in Europe, Australia and the USA.